If one finds diversified eating habits in the fifteen or so countries located around the Mediterranean Sea, there is at least one constant: the abundant use of olive oil. 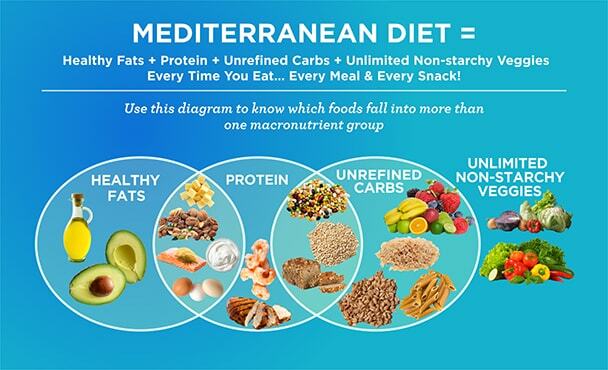 When referring to the "Mediterranean diet", reference is made to the traditional diet of the Greek islands of Crete and Corfu - hence the term "Cretan diet". Interest in this type of diet stems from Ancel Keys' The Seven Countries Study, which showed that despite high dietary fat intake and a relatively rudimentary health care system residents of these islands (as well as those of southern Italy) enjoyed excellent life expectancy in adulthood, in addition to having a very low rate of coronary heart disease. Later, Professor Serge Renaud - discoverer of what, in nutrition, we call "the French paradox" - published a research (The Lyon Diet Study) which revealed that subjects who had already been victims of a first infarction and who Cretan-type diets had a 75% lower rate of stroke and stroke, while the low-fat dieting group experienced only a 25% reduction. Since the publication of this study in the highly respected medical journal The Lancet in 1994, the popularity of the Mediterranean diet has spread like wildfire throughout the world and scientific studies continue to prove its effectiveness in the prevention of many diseases. It should be noted that Cretans - who still have the lowest rate of cardiovascular mortality in the world - still eat today in a traditional way, consuming very little imported and processed food. Improvement of health in general. This diet is a whole. It combines food moderation and a wide variety of foods (and therefore nutrients) to an active lifestyle every day. Its basic principles are easy to understand and follow. Abundance of complete grain products. Abundance of fruits and vegetables. Abundance of garlic, onion, spices and aromatics. Use of olive oil as fat. Daily consumption of legumes, nuts and seeds. Daily consumption of yogurt and cheese. Daily but moderate consumption of red wine. Large consumption of fish (several times a week). Limited consumption of chicken and eggs (a few times a week). Limited consumption of sugary foods (a few times a week). Very limited consumption of red meat (a few times a month). A reasonable daily calorie intake (1,800 to 2,500 calories per day). Its benefits are often attributed to the high intake of monounsaturated fatty acids from olive oil and low intake of saturated fatty acids. Indeed, a diet rich in monounsaturated fatty acids reduces total cholesterol and bad cholesterol (LDL), and increases that of good cholesterol (HDL). In addition, it is believed that large quantities of fruits and vegetables provide an excellent source of antioxidants that help protect against the diseases of aging. In fact, it is the synergy of the many nutrients and phytonutrients found in the Mediterranean diet as well as an active lifestyle that helps prevent disease. Integrating only some of the principles and ignoring others may not generate the same beneficial effects. The most recent study published in 2013, once again recognizes the benefits of the Mediterranean diet for cardiovascular events and mortality1. In another study published in 2011, it was also shown that the Mediterranean diet was more effective than a low-fat diet in inducing changes in cardiovascular risk2. In addition, the most recent scientific journals report a loss of weight and a decrease in blood cholesterol levels when joining the Mediterranean diet. It is also interesting to note that even in the absence of weight loss, the Mediterranean diet can lower cholesterol levels3. This diet offers a good variety of unprocessed nutritious foods with which satiety is easily achieved, which makes it pleasant to follow. There are no forbidden foods, although many are "restricted". Its basic principles are easy to understand and can easily be applied at home. In large and medium-sized cities, if you know how to choose your restaurant, it is easy to eat "Mediterranean". Choices may be more limited in the region. A study conducted at the Harvard Medical School found that people who were fed Mediterranean food for 18 months lost more weight than people on diets whose only characteristic was to be low in fat. Mediterranean people enjoy sunshine all year long, which gives them a regular vitamin D synthesis. For people in the Nordic countries, cow's milk is the main source of this vitamin. Since milk is not part of the diet, you have to rely on a high consumption of fatty fish (especially salmon, mackerel and sardines), as well as on yogurts enriched with vitamin D, or, at the limit, on supplements. Otherwise, a vitamin D deficiency is possible. Wine consumption can be adopted or not, depending on the personal experience and attitude of each individual to alcohol. In Crete, it is consumed in small quantities, with meals. For people who are not used to consuming olive oil, fish and legumes, adding them to the diet gradually, in small amounts at a time, can facilitate integration. The Mediterranean diet is easy to integrate into its diet: it allows great freedom in its food choices in addition to a renewed seasonal freshness. Adopting it can be favorable both from the point of view of health and gastronomy. It can be recommended to anyone wishing to improve their quality and life expectancy. It is good for children because they are at the ideal age to establish healthy lifestyle habits. Adolescents, however, can be a little daunting in the face of a diet that moves away from the North American diet: know how to use patience and perseverance!